I spent all day yesterday playing in a ultimate frisbee tournament for charity, and though my team came in dead last, I still got to take home a nice 1 liter water bottle. But this mornign I came across the $22 Firefly lid for wide-mouth water bottles, which lets you turn your hydration source into a nice blue lantern. 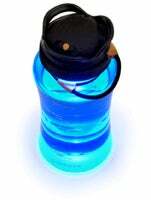 The concept is simple: the lid contains a separate sealed compartment with a bright blue LED. A control on top lets you switch between different light levels, and the glow permeates the water to create blessed light. Ideal for camping trips, or freaking out people that your water is radioactive. Whatever your little heart desires. Sadly, the water bottle I won is not compatible with the Firefly. One can only hope that a narrow-neck version is in the works.